Being an RV owner can be quite a hassle in one stress-filled area, cleaning. I mean, if you’re living your best RV life possible, there isn’t a week that goes by without some dirt or sand invading your RV. With this in mind, you must think about how beneficial a high-quality vacuum could be to your RV living. Honestly, if you have the best RV vacuum possible, you won’t have to think for more than a couple of seconds about the nuisance dirt or sand can provide. Instead, you’d simply turn on your top-notch RV vacuum and let it get to work. And due to this, we thought it was imperative that we provide you with a buying guide for these RV vacuums. After all, there’s no reason your trip or vacation should be complicated by something as insignificant as a piece of sand or dirt. It isn’t something that should become an overwhelming hassle for you when products like the vacuums we review in the next section exist. So please, read on and find the right RV vacuum for you. Trust me, it will make your RVing life a whole lot easier, and you can rest easy knowing that it will always be ready for when you need it most. As the title of the section suggests, this part of the article will provide you with product reviews. These product reviews will discuss the ten RV vacuums that we consider the best on the market. Hopefully, these reviews will help you establish exactly what you’re looking for in your next RV vacuum. As a pet owner, there’s very little about the Shark Rocket Corded Ultra-Light Hand Vacuum that I don’t love. It seems ideally suited to handle all the stains and dog hair that my precious dogs will bring on board my rig. I mean, it has both a TruePet Motorized brush, which will take care of those awful stains my dogs will inevitably leave behind and a mini motorized brush that will make sure dog hair doesn’t take over my upholstery. Honestly, I couldn’t ask for anything more in the pet department. Aside from mitigating the damage that my pets will do to my rig, this vacuum is also incredibly convenient from a practical standpoint as well. See, at less than four pounds, I won’t have to worry about my arm getting tired holding this handheld model. And that’s my main issue with handheld models; I don’t like the idea of always having to hold my vacuum in my hand during my cleaning sessions. It just seems like a lot of wasted effort. But being this lightweight, it doesn’t seem like I’d mind it that much with this model. It also helps that it has a 15-foot long cord, which is more than enough length to move all around my rig. Now, usually I’d opt for a cordless option, but I feel like the length of this cord wouldn’t restrict me too much during those cleaning sessions that I loathe. But it’s not all positive. Some customer reviews complained about this vacuum cleaner’s battery being a little less efficient than its competitors. In other words, it had issues staying charged. Not an ideal quality for an RV owner to have in their vacuum cleaner. 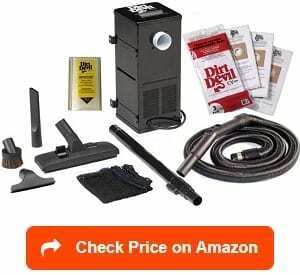 The first RV vacuum system on our list, the HP Products Dirt Devil RV Central Vacuum System is one of my favorite models and what I consider the best rv central vacuum system on the market. The best part about is it does it’s just job efficiently without much hassle concerning its performance. See, in most of the customer reviews, all you would read was about how incredible the suction on this product was compared to other vacuums they had tried in the past. For me, this aspect would be an issue because of my wall to wall wool carpeting; wool needs a gentler vacuum rather than an aggressive on such as this model. Nonetheless, this cleaning system would be perfect for someone with a carpet made with nylon or polyester fibers. Honestly, if I did have a carpet with a synthetic fiber, I’d have to move this toward the top of my list; it’s everything you could want in a vacuum cleaner. And since it’s an RV cleaning system, it has fantastic storage capabilities as it can be installed in closets, under seats, or in a storage compartment. It would give me much more living space than a lot of the other products on this list as it only takes half a cubic foot! I didn’t even mention that it also comes with an expandable hose, which makes those difficult to reach places a lot more manageable. All in all, a fantastic product that deserves all the praise that it has heaped on it in its customer reviews. However, speaking of customer reviews, there was a little thing that kept coming up, which bothered me; people often complained about the install being complicated. Just something to keep in mind before going all in on this RV vacuum. The BLACK+DECKER Lithium Hand Vacuum has a lot of things go for it. The first being it’s quite an affordable option. It’s much less expensive than the first handheld model we reviewed and doesn’t suffer in the quality department either. For example, it comes equipped with a flip-up brush that will ensure your upholstery stays clean. Again, as a pet owner, this type of feature is a must-have for me. The amount of hair these dogs shed would astound you. More importantly, it uses lithium technology for strong suction and longer battery life which conveys this model is very user-friendly. Something that’s further conveyed by it being cordless; a feature that I can’t express enough admiration for, given my hatred of cords. By being cordless, it saves me the hassle of constantly having to change outlets. Instead, I can bring this vacuum wherever it needs to go without dealing with any troubles or complications. It might not sound like a big deal, but it is considering my RV doesn’t have an abundance of outlets. Plus, it’s rechargeable, which further speaks to its overall convenience. In the end, this handheld RV vacuum could quickly move to the top of my list. However, there’s one little aspect that makes sure this model doesn’t, the noise level. According to the customer reviews, this vacuum has a very loud noise operation. Now, I usually would take this noise complaint with a grain of salt; people tend to be very finicky about this sort of thing. But in this case, the claim was so widespread I had to mention it. And honestly, if the noise level is this bad that it bothers a majority of the people, it’s just not something I want to deal with on my relaxing RV trips. 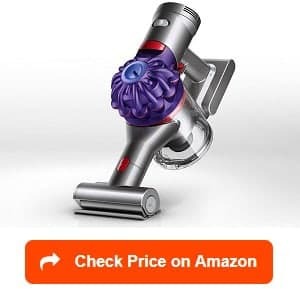 One of the most popular brand names in vacuum manufacturer game, Dyson, offers a premium RV vacuum any RV owner would be lucky to have: the Dyson Car+Boat Cord-Free Handheld Vacuum Cleaner. This cordless vacuum gives the user all the freedom of movement in the word. There isn’t a corner or crevice you couldn’t clean with this model. If you get this vacuum, your whole RV will be free of the nuisances dirt, or sand might provide. It even comes with an extension hose to further its reach capabilities. I mean, this vacuum simply isn’t playing on the same playing field as its competition. In fact, the suction it provides is among the most powerful you’ll ever see from an RV vacuum. But as previously stated, I need a model that will be a little gentler, so, this Dyson product won’t be a good fit for me. It’s a shame too because I love the mini motorized tool that makes upholstery clean-up almost too easy; dog hair would be no match for this vacuum. And it also comes with a two-year warranty, which conveys Dyson’s faith in the product. All in all, this RV vacuum cleaner is almost everything I’m looking for in my next one, but it falls short in an essential category as it’s a little too aggressive for my particular carpet. Furthermore, it’s outlandishly expensive for a handheld cleaner. If I bought this model, it would essentially clean out my bank account, which is just not what I’m looking for to happen. 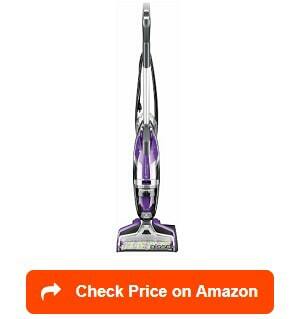 But if you’re willing to pay top dollar, you can’t do better than this vacuum from Dyson. Our only wet and dry RV vacuum cleaner, the BISSELL Crosswave Pet Pro All in One Wet and Dry Vacuum Cleaner, allows the user to both vacuum and mop their floors at that same time; an extraordinarily convenient feature any RV owner could see as beneficial. But that isn’t even my favorite thing about this model. It also has a multi-surface pet brush that will make sure whatever nuisance your pet manages to provide your floor isn’t even an issue. Furthermore, it has a pet hair strainer that separates the pet hair from the rest of the waste for easy empty. As a pet owner, these two features are certainly something I appreciate and anticipate would make my life so much easier. And to further make a pet owner’s life simpler, BISSELL offers a bundle buying option with the inclusion of specialized pet formula that’s designed to remove pet odors. I mean, this company went out of their way to appeal toward my specific needs as an RV owner with pets. There’s nothing about this product concerning its quality that you could point to as inadequate or lackluster. They even made sure the vacuum was relatively lightweight compared to other wet and dry vacuums. This product is for sure a high-quality model that should more than meet any cleaning need you could ever have as an RV owner. But given the myriad of high-quality, the one negative this vacuum has shouldn’t surprise you. 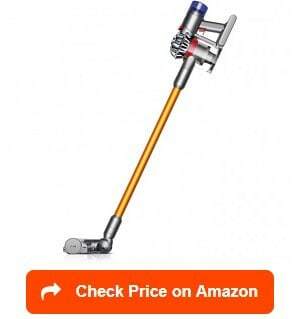 The price is and steep; therefore, it will put a dent into your bank account, so, that’s something you must be aware of before adding this vacuum to your Amazon cart. Our first upright vacuum, the SOWTECH Stick Vacuum, offers high-performance at a low price you won’t mind paying. 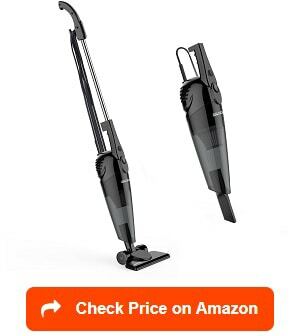 In fact, this model might be the best bargain buy on here, so, if you’re a little cash strapped you might want to take a look at this vacuum. But don’t think it being low-priced is the only benefit it will offer the person that buys this product. It has numerous other features that any RV owner could find useful. For instance, this upright vacuum can be converted into a handheld one in a matter of seconds. Therefore, any hard to reach places filled with dust won’t stand a chance against this vacuum from SOWTECH. I also like how lightweight it is for an upright model; you’ll have no issues move this around the RV. In any estimation, this vacuum is incredibly user-friendly and won’t cause you any significant hassles or complications. See, it has a 16.5 ft long cord that will give you enough reach to maneuver around long spaces without having to change outlets continuously. Plus, as previously mentioned, it’s incredibly low-priced compared to other products on this list, so, you should at least consider trying this model out. In the end, it’s just a product that was meant to appeal toward bargain buyers like myself. However, as any bargain buy, it does have an issue attached to it. 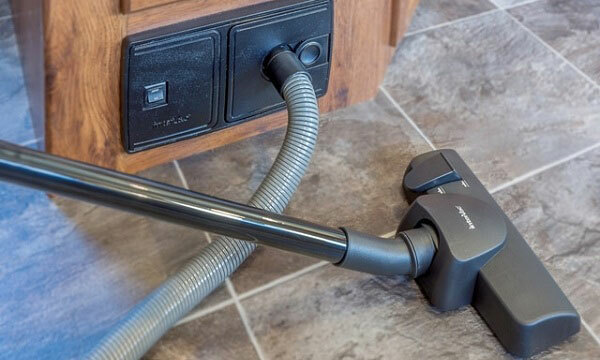 It seems this vacuum’s suction is a little bit less power than other models, which could be an issue for some RV owners as demonstrated in the customer reviews. But as someone with wall to wall wool carpeting, this gentler suction is precisely what I’m looking for in an RV vacuum cleaner. 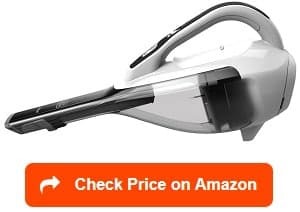 Another product that will appeal to the bargain buyers among you, the VonHaus Gray 2 in 1 Corded Lightweight Stick Vacuum is an upright model that isn’t lackluster in quality. In fact, even at its low price, it’s a high-quality option any RV owner would be happy buying. But besides the performance quality, there’s one aspect about this vacuum that I find incredibly appealing; you can choose the color. Now, you’re probably asking yourself why the color matters? Well, it doesn’t, but I like that the option is given to me. And honestly, the orange model does look pretty nice to me, so, I’m all for the colored vacuum cleaners. Besides this little feature, it doesn’t lack in performance areas either. For instance, it can be turned back and forth from an upright to a handheld model. Just like our the last product we reviewed, this feature makes sure there isn’t an area within your RV that isn’t cleanable. Honestly, I love the idea of being to convert the vacuum back and forth to fit the needs of whatever you intend on cleaning. And as equally important, the dust container is easy to remove, so, the getting rid of the waste process won’t be the hassle it is with other models. Plus, it has a 19.5ft cord that ensures you won’t have to keep switching outlets as you’re cleaning. But there’s always a negative and with this product its centers around its durability. See, a lot of customer reviews were complaining about parts of vacuum breaking off after heavy usage, which is a warning sign that I can’t overlook; therefore, this product is a no-buy for me. Our second BLACK+DECKER RV vacuum, the BLACK+DECKER Max Lithium Pivot Vacuum, further cements the good standing rep this company has with its quality performance. And in doing so, it also has numerous features that make it an attractive option for RV owners. For instance, it comes equipped with a rotating nozzle that can rotate while providing suction simultaneously. Now, this feature might not sound like a big deal, but it saves you from having to stop everytime you reposition the nozzle. Plus, it’s also equipped with a head that can twist in different directions, which make it incredibly capable of cleaning any tough to reach places. And given the various nooks and crannies in my RV, this feature could be somewhat useful. The vacuum also isn’t too heavy; therefore, making it very convenient for any RV owner who intends on moving the vacuum from place to place. It also means that the vacuum isn’t too bad with its storage capabilities either, which in my eyes is always a plus. And the best part about this vacuum with all these cool features is that it’s affordable. 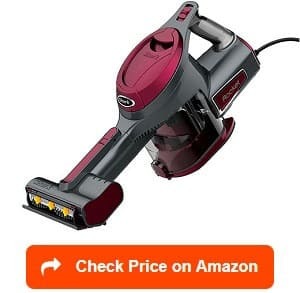 There’s no reason the price of this vacuum should hurt your bank account too much, and it borders on the line of being a bargain deal. But there’s one colossal drawback that would make me hesitant about buying this model. The noise level has been consistently complained about in the customer reviews. In fact, it was shocking when I found a review without it being mentioned. With this in mind, I think I’d have to pass on buying this particular RV vacuum. I don’t want to have to deal with having a constant migraine every time I turn on this rather loud model. 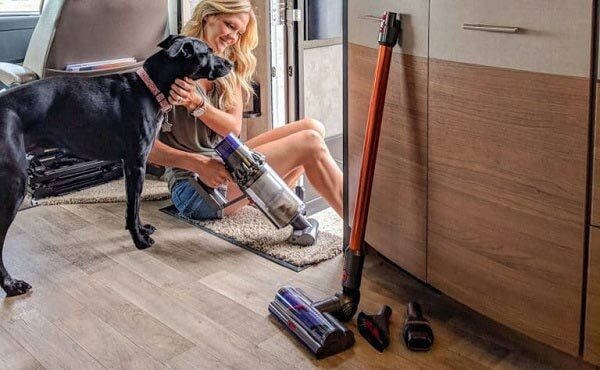 By far, my favorite RV vacuum on this list, the Dyson V8 Cordless Stick Vacuum Cleaner, comes with every imaginable feature I could ever envision except one (more on that later). First, it’s cordless which gives it the freedom of movement that the corded versions simply don’t have in their capabilities. It’s nice to know you don’t need a constant source of power when you’re cleaning. It makes every part of the cleaning process so much easier. And given the amount of runtime this vacuum offers, 40-minutes, it’ll be hard to pass up a chance of getting this model. The vacuum being lightweight doesn’t help my goal to resist buying this product either. Honestly, you don’t realize how much this matters until you’re lugging around a heavy vacuum all over your RV. But I’ve talked enough about why being lightweight is an essential piece of the best RV vacuum cleaner puzzle. So, I’m going to move onto a feature I adore, the HEPA filtration. With this feature, you won’t have to worry about allergens being a problem. In fact, this feature renders them unproblematic as it captures allergens and then expels cleaner air in their place. I mean, if that’s isn’t the best feature ever, I don’t know what else could be with these types of products. 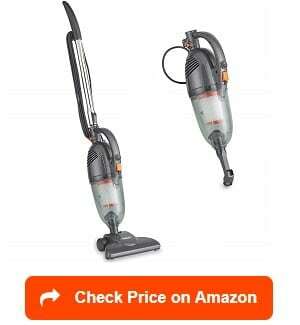 But as I mentioned before, there was one necessary feature this vacuum fails to check off: reasonable price. However, I’m going to give in and splurge for this fantastic piece of equipment. And you should do the same if you have the money available. But if you don’t and aren’t irresponsible like me, you should look elsewhere. I mean, all the options on this list are fantastic, so, you shouldn’t feel the need to splurge unless you think it’s necessary. Our last product, the Dometic Central RV Vacuum System, provides excellent performance from a vacuum that doesn’t offer many additional features. And honestly, sometimes that’s a good thing, which is the case with this product. Now, the best thing about this product is the install causes no hassles. Often, with these RV vacuum systems, the installs tend to get more complicated than they should be and it frustrates people like me who aren’t the best with mechanical things. But thankfully, this model is the exact opposite of this and is easily installed in whatever location you deem appropriate: under a seat, in a closet or storage compartment. Once installed, it also has the added benefit of not taking up much room either. Therefore, you’ll barely have to sacrifice any living space if you decide on purchasing this model. Then, when you start using it, you’ll notice another fantastic benefit this model provides; great suction. Honestly, with this amount of power, you shouldn’t have any issues with performance. In other words, this vacuum will do the job quickly and efficiently without causing any problems or issues and isn’t that what we are all looking for in these types of products? So, in the end, it’s a no-buy for me. But if you want something simple and efficient, this vacuum could be the one for your RV. An RV vacuum might seem like a rather simple product to research information about; I mean, it’s a vacuum after all. But there are some necessary components you must think about before finding the high quality RV vacuum for your circumstances. And that’s what this section will discuss; the factors that will ultimately decide what vacuum is the right purchase and what ones might be the wrong purchase. In the RV vacuum world, there are five different types that you must be aware of before purchasing a new one: RV central vacuum systems, handheld vacuums, wet and dry vacuums, steam vacuums, and upright or canister vacuums. Now, we’ll go into more detail about each type in our FAQ section, but the main thing you must know is there are specific scenarios where one type might be a better option than another. For instance, if you have an overwhelming need to clean wet areas, you should look at wet and dry vacuums. On the other hand, if you have an RV interior with a lot of hard to reach places, a handheld model might be more your speed. It’s little details like these that will decide exactly which type you might end up going with for your RV. In my particular case, I think I’m going to go with an RV central vacuum system because it’s incredibly convenient from a storage perspective. See, these models can be installed in closets, under seats, or even in a storage compartment. But I’d have to take a hard look at some steam vacuums and handhelds as well because I have pets I intend on bringing with on my trip. And these units are excellent at disinfecting pet stains/ deodorizing pet odors. Overall, deciding what type of RV vacuum you need is about understanding exactly what requirements would fit your needs the best. So, think about what you really need in an RV vacuum and match them to the type that matches those requirements the best. You’d think something as simple as a vacuum wouldn’t have anything complicated about it; but just like all products these days, manufacturers have decided to make things difficult for us customers with additional features and other unnecessary stuff. Therefore, you must ensure the RV vacuum you chose isn’t too complicated and that it won’t be a hassle to use. You can figure it out by doing one simple thing, reading the always entertaining customer reviews. I mean, there’s no way that the customer won’t be either complaining about the product or praising it. After all, it’s what they’re there to help you figure out; whether or not the product is user-friendly. Honestly, this factor might be the most essential one in this entire section because who’s going to use a product that only causes them stress? I know I wouldn’t. So please, read the customer reviews or rely on my ability to determine user-friendliness before completing your purchase. 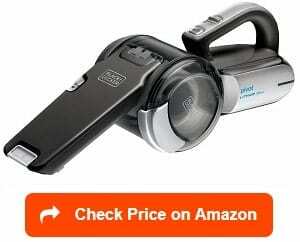 Just like with ease of use, you’ll be able to determine the vacuum’s noise level by reading the customer reviews. For instance, if you see someone describe the vacuum as deafening, you might want to look elsewhere. After all, an RV is supposed to be a place of relaxation and free of stress. A loud vacuum cleaner is the antithesis of those two feelings and could create an unpleasant environment for everyone onboard. Instead, look for reviews that describe the vacuum as uncommonly quiet or the noise level is manageable. Honestly, there sadly isn’t a vacuum out there that’s is whisper quiet, so, beware of any company which describes its product of having such a quality. RV vacuum cleaners come in all shapes and sizes. And given this knowledge, you shouldn’t be shocked to learn they also come in different weights as well. I know, not exactly shocking news; however, it’s still vastly essential to the overall decision-making process. I put a lot of weight, pun intended, on this particular quality because you’re going to be lugging this vacuum cleaner around from place to place. You don’t want it to be overly heavy, or this could get taxing after a while. Therefore, you’re going to want a lightweight model. It will make your life ten times easier, especially, for someone like me who tends to spill everything. And you won’t have to worry about it being a hassle moving your new RV vacuum around your RV. The type of carpet your RV has is essential to your decision-making process. In fact, it will have a significant impact on what product will be the right RV vacuum cleaner for you. The carpet you most likely have are either nylon, polyester, or elofin, which are suitable for an aggressive vacuum cleaner. However, some carpets are made from natural fibers and need a vacuum cleaner that is a little bit gentler to ensure it stays in pristine condition. For instance, if you have wall to wall carpeting in your RV, it’s highly probable that the fibers are wool. Now, wool is pretty durable, but it still needs a vacuum cleaner with a gentler approach. Therefore, you should look for a vacuum with gentle/flexible brushes on the revolving brush. But be sure the revolving brush doesn’t have the same density as the carpet because it will take a toll and wear it out. For me, I’d have to go with the gentler vacuum cleaner as I have wall to wall carpet that’s made with wool fibers. It will make sure my carpet stays in good shape for years to come. It will also ensure my proclivity for spillage doesn’t become a bigger deal than necessary. As you can see, assessing the type of material used in your carpet is a crucial factor in making an informed decision about the RV vacuum cleaner you plan on purchasing. If you don’t, you could end up doing real damage to your RV’s carpet. Now, some of these RV vacuums will come with a battery. If you chose to get one with a battery, you’re going to want one with a long battery life. If you don’t, it’s going to be a real hassle for you; you’ll need a constant connection to a power source, which makes cleaning a real pain. Furthermore, it’s also essential you ensure the battery is high-quality, which means reading the customer reviews and seeing what other customers had to say about the batteries performance. All in all, you’ll want a battery that can handle a long cleaning session away from the power source. Any good FAQ section will provide the reader with answers for the remaining relevant questions that might be rattling around inside their head. And this one will be no different, as we will try to solve any leftover issues you have with these particular products. What is an RV vacuum? There are a lot of different RV vacuums out in the world today, and it makes it hard to talk about these products in general terms. But the main gist is that these vacuums will get rid of the various substances that have a tendency of piling up inside your RV. In other words, these RV vacuums are explicitly built to meet the environment your rig presents. And that’s why there are so many different variations of RV vacuums; one might be perfect for one RV and god awful for another. Therefore, you must take into things like how you will use it, how intense your cleaning needs are, the flooring of RV, etc. All these little things will help determine the right type of RV vacuum for you. Regarding how these vacuums work, typically they rely on five major components: the exhaust port, intake port, fan, electric motor, and the porous bag. First, you plug in the vacuum, which will activate the motor. As the motor kicks on, the fan will start making air flow to the exhaust port. This air flow will create opposite pressure that creates the suction. Then, the intake port lets air push to the cleaner, which causes the friction that makes all the dirt/debris get sucked into the vacuum. Not too complicated right? Honestly, the whole process is remarkably similar to the one a regular household cleaner would go through; but the manufacturers adjust specific aspect such as suction power to fit the environment an RV provides. In the end, the key is finding the RV vacuum that fits your rig’s environment the best and is available at a price you don’t find too outlandish. And hopefully, our article helps you find that exact model; maybe it will even be one from our product review section! 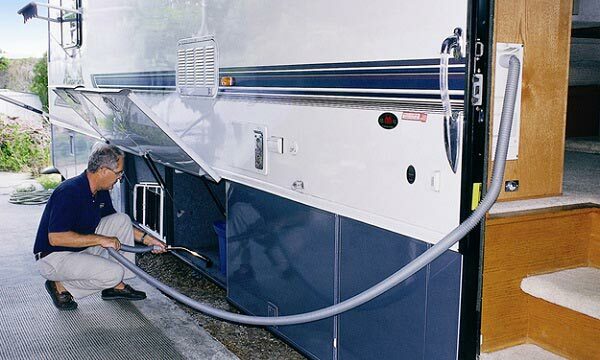 What are the different types of RV vacuums? Since we covered what these vacuums are and how they work, we thought we’d dive into all different types of vacuums you might encounter in your research. Now, if you’re going to find an RV vacuum for your rig, there are five different types that you must know beforehand: RV central vacuum systems, handheld vacuums, wet and dry vacuums, steam vacuums, and upright or canister vacuums. RV Central Vacuum System tend to be very run of the mill type products. These are often the models that come with the RV when you first get it. And they need a power source to run but offer some other benefits such as being easily stored that making them necessary for us to consider. If you have a lot of hard to reach places inside your RV, a handheld vacuum might be the one for you. As you expect from the name, these model are handheld operated, which means incredible movability and storability. They also typically tend to be very high-powered and are heavier as they come with a battery. Steam RV vacuums can be godsends for RV owners with pets or mold-related issues. See, these models are incredible and designed to disinfect and deodorize stains which is crucial for pet owners. As a pet owner myself, I know how much damage, whether its throw up or a bathroom accident, a pet can cause your furniture. If you intend on cleaning up a lot of wet spots in your RV, a wet and dry RV vacuum would be your best bet. See, these models come with two buckets that separate the wet waste from the dry, which makes it incredible at cleaning up wet areas such as sinks and bathrooms. However, if you don’t plan on cleaning a lot of wet areas, there’s no point in getting a wet and dry RV vacuum. It just wouldn’t make sense either financially or logically. Our last type of RV vacuum is the upright or canister model, which can be a convenient purchase depending on the amount of flooring and carpeting in your RV. Honestly, it’s basically a bigger version of a handheld model given the attachments that typically come with them. Why do you need an RV Vacuum? ou need an RV vacuum for a very simple reason that you already know: to keep your RV free of things like dust, sand, and other nuisance substances. I mean, aren’t you tired of finding sand in your shoes because you didn’t have a vacuum that could do a little clean up duty after your recent beach trip? Likewise, having an RV vacuum around your rig is just a practical and necessary part of the RV life. Honestly, do you want your RV full of cobwebs and stains? Since I’m guessing your answer is no to these questions, there’s no reason why you shouldn’t have a high-quality RV vacuum at your disposal. Now, if you’re wondering, why you can’t just use your regular household vacuum on board your RV? Well, it’s because household vacuums are developed for different surfaces and environments than what you’d see in an RV. See, RV vacuum manufactures take into account the size and unique shape of RV’s. Then, add these factors into their vacuum design; therefore, creating products that make cleaning an RV so much easier for any RVer. In the end, these RV vacuums are tailor-made towards the interior of an RV; therefore, opting for a regular model doesn’t make much sense. I mean, these regular ones will work, but it will just cause more stress and issues than a high-quality RV vacuum would. After all the knowledge about RV vacuums that you’ve acquired, I’m quite confident you’re ready to make your final decision. 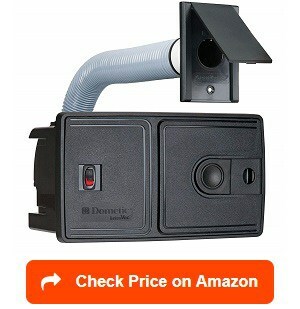 So now comes the easiest part, moving your preferred RV vacuum into your Amazon cart. Once you choose the best RV vacuum for you, you’ll never have to worry about being unprepared against the dust or sand that ultimately accumulates in your RV. Instead, it will be easy as turning on your vacuum and watching those worries flutter away. Then, there will be nothing to distract from enjoying your RV trip or vacation. Now, you can sit back and relax without worrying about a pile of dust triggering an allergy attack or sand finding its way into your shoes/socks. I know, I absolutely despise when that happens; I am sure you do too. So thanks for reading and make sure you get a good RV vacuum that checks all the boxes for needs. When you do, I promise you won’t regret it. We would like to thank you for reading this article. Find out more about how to choose the best RV thermostats, best RV air conditioners, best RV grills and best RV vent fans with our reviews and ratings. Furthermore, please take a look at the best RV dehumidifiers, best 12 volt refrigerators, best RV washer dryer combo and best RV heaters, to buy the best one for your RV appliances, heating, ventilation and air conditioning.